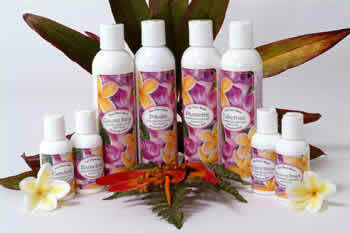 Silky smooth lotion handcrafted in Maui ¤ Hawaii. As sacred hula is to the world of dance... our tropical handmade lotion is to the world of totally exciting skin care. Blending six natural skin conditioners and four vitamins... this Maui lotion is not just another pretty package. Its exceptional ingredients make it the crème de la crème of all Maui handmade lotion. Made with deionized water ¤ aloe vera gel ¤ stearic acid ¤ sweet almond oil ¤ glycerin ¤ shea butter ¤ vegetable based emulsifier ¤ hydroethlcellulose (from corn) Vitamins A ¤ D ¤ E and B ¤ Jojoba oil ¤ Kukui Nut oil ¤ methyl/propylparaben ¤ TEA and fragrance. Just click GREY Buttons to add item to your shopping cart. Whether you?re a skin care professional or a skin care devotee, it?s the look and feel of your skin that will tell the tale. To make this one of a kind lotion even more perfect we?ve captured the arousing tropical scents of our island home and tucked them in just for you. Now you can have your own Island experince in your home everyday. Having difficulty choosing from this fabulous array of fragrances? No need. Pick your top three and order a sampler of 3 - 2 oz. bottles. Lotion Sampler presented to you in a lovely drawstring Gift Bag. "I met your lovely wife at the Sunday market back in January. I was in Maui with my husband for 10 days and the first Sunday I bought 2 Shea Body Butters (after having a great time testing them all and having a nice conversation with your wife). I loved them so much I went back the following Sunday and bought several more. I gave several for gifts and have already gone through 3 myself, so you can certainly count on me as a regular customer! I love your products." Just wanted to let you know how much I love your coconut mango lotion. The smell takes me back to Maui every time I use it and have had many compliments on the beautiful scent. Besides the lovely smell it is the best moisturizer I have ever used, goes on smoothly, non greasy and I can't believe how long it stays with your skin. We were in Maui for a wedding and purchased your Plumeria Lotion, which we loved. We noticed the web site on your label. Plumeria flowers have a most delicious smell and love your lotion. I sent a couple bottles to my 98 Year old aunt in the Netherlands. She states she has never had such soft skin. "I was in Maui about a month ago and a friend gave me this lotion as a welcoming gift. I started using it and my skin has never felt so nice. Specifically, it smoothed out those bumps that you sometimes get on you upper arms. So I've been raving about it to my friends and they all want to try it." Yes! send me any Special Deals! ALL transactions are ENCRYPTED for your Security, Protection and Privacy! Copyright © 2001-2017 Sun Flare Maui All rights reserved.